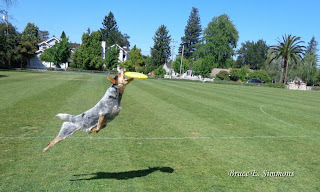 Have you ever wondered who started this sport of disc dogging? 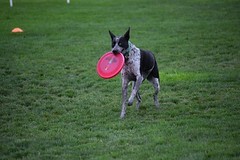 I know I have wondered about the history of this sport of disc dogs, or more specifically, why on occasion I experience the occasional claw in the back of the neck ending up oozing vital life fluids? 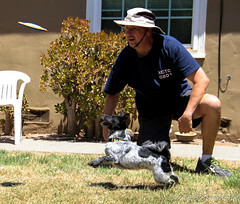 I wondered if kings and queens had some kind of entertainment with dogs and discs? Will there be silent films or sepia tone pics of men in suits throwing discs for their dogs between fox hunts? It seems the origins of the sport may not be quite that romantic. 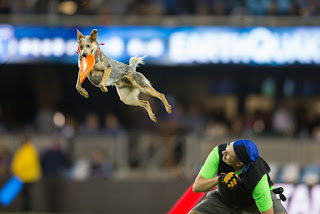 Believe it or not the sport of disc dogs became a public thing on August 5th, 1974, when a 19-year-old named Alex Stein broke into, yes, broke out onto a sporting event field, a nationally televised baseball game between the Los Angeles Dodgers and the Cincinnati Reds, with his dog, whose name was Ashley Whippet, and started doing tricks on the field. While on the field he had his dog hitting high speeds and supposedly chasing 90-yard tosses and jumping high in the air to catch discs. His demonstration started in such an entertaining fashion that they stopped the game and let them play for 8 minutes. 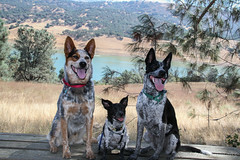 In fact one of the TV announcers continued to announce... the dog action! At the end of it, Alex was arrested and hauled off for trespassing on the game. And true to form, no one from the PD bothered with the dog, but Ashley was caught by a kid in the stands and Alex and Ashley were reunited several days later. 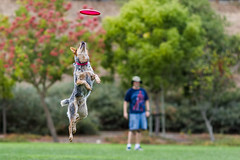 But it was worth it because they had made their mark on the world, letting people know what kind of fun people can have with dogs and discs. How did this crazy idea of Alex's come about? 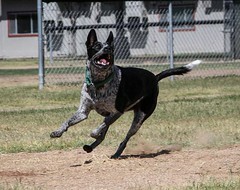 A few years before that night, a young man, a college student named Alex Stein received a dog as a gift from a girlfriend, and according to sources, when his dog was at a ripe young age of 3 weeks old, Alex figured his dog would be famous. He named him Ashley Whippet. 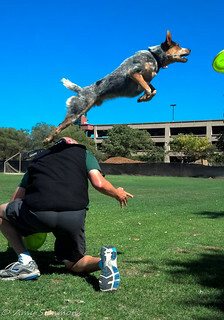 While he was a puppy, Alex weened him using Frisbees to feed him. 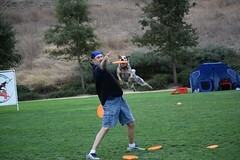 Then as the dog got older and Alex would throw a disc, the dog would go after it! 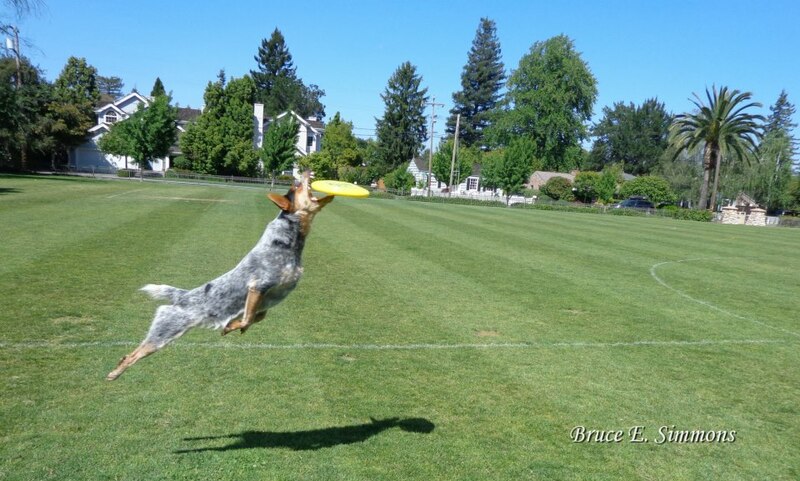 What's astounding is that at the ripe young age of 6 months, Ashley reportedly was able to get 12 feet in the air to catch discs. 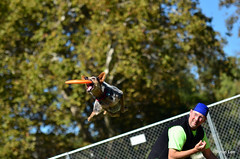 Aside from that, Alex spent a lot of time taking his pup to the college greens and having fun while crowds gathered.